Jewish leaders from Greece are seeking over €25 million (US$27 million) in reparations from Germany some seven decades after Hitler forced Jews to pay the transport costs for their passage to concentration camps. In 1943, an estimated 58,585 Jews boarded trains from Greece’s second-largest city of Thessaloniki to concentration camps in Poland. To add insult to grave injury, the Jews were forced to pay for their train fare, which exceeded 2 million reichsmark - about €25 million today. David Saltiel, president of the Jewish community of Thessaloniki, said German reparations could finance a Holocaust memorial on the site of the train station from which Jews departed for Poland during World War II. “We think it’s a big opportunity that if the German government decides they want to help, it would be a very good coincidence that this money goes for this purpose,” Saltiel told Newsweek. Some 60,000 Greek Jews – about 75 percent of the country's Jewish population at the time – perished in the Holocaust, according to the Yad Vashem Holocaust museum and research center. The Nazis deported more than 45,000 from Thessaloniki to the Auschwitz concentration camp in Poland. The demand by the Greek Jewish community comes at a time when Greece's new Prime Minister Alexis Tsipras, following in the footsteps of other past Greek governments, is also attempting to recover damages from Berlin over 476 million-reichsmark (€6 billion) loan to Nazi Germany. The occupying Nazis in 1942 forced Greece to deliver them the interest-free loan, valued at 568 million reichsmark (€7.1 billion). “It’s not a material matter, it’s a moral issue,” Tsipras told reporters on Monday following a meeting with German Chancellor Angela Merkel Berlin. In response, Merkel was uncompromising, saying there could be no connection with Athens receiving more rescue funds and the issue of long overdue Nazi-era loan debt. “In the view of the German government, the issue of reparations is politically and legally closed,” she said. Tsipras also put aside rumors that Greece might seize German property to cover their claims. "There is no member of this government who has expressed any Greek government intention to take over Germany-owned buildings - this was going around a lot recently, as well as the idea to put an end to the important and great activity of the Goethe institute in Greece," Tsipras said. "None of this is true." 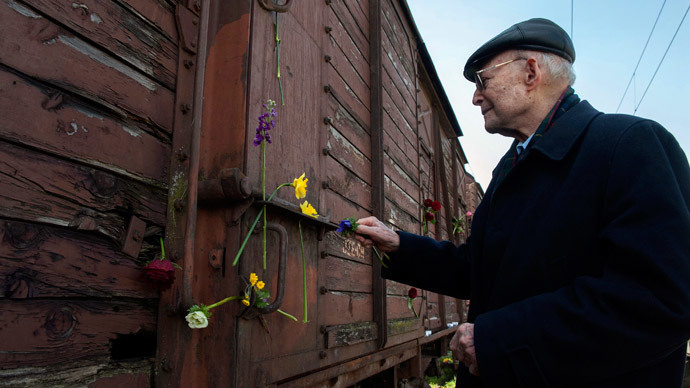 Last week, Greek Jews from Thessaloniki, which had the largest Jewish community in Greece before World War II, remembered the 72nd anniversary of the first wave of Nazi deportations to Auschwitz.